UNIT 8 US FOREIGN POLICY IN LATIN AMERICA, 1898 TO 1945 8:1 US overseas expansion: US policy toward Latin America was based on the USs self-interest. The. 1 UNIT 8 US FOREIGN POLICY IN LATIN AMERICA, 1898 TO 1945 8:1 US overseas expansion: US policy toward Latin America was based on the USs self-interest. The US focused on the Caribbean and Central America. 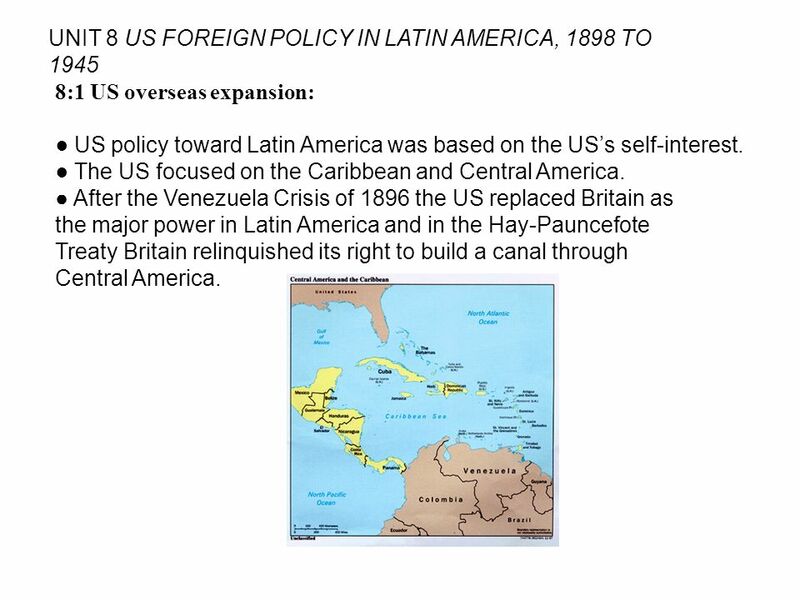 After the Venezuela Crisis of 1896 the US replaced Britain as the major power in Latin America and in the Hay-Pauncefote Treaty Britain relinquished its right to build a canal through Central America. 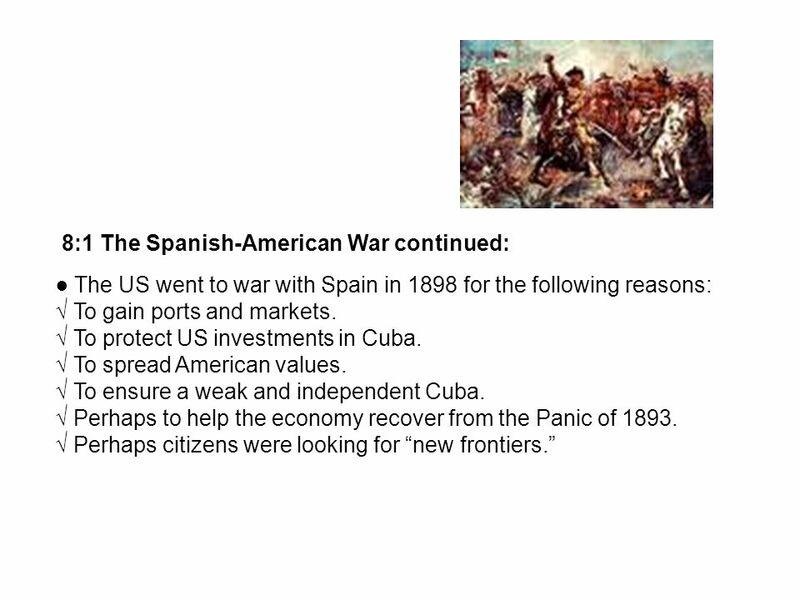 3 8:1 The Spanish-American War continued: The US went to war with Spain in 1898 for the following reasons: To gain ports and markets. To protect US investments in Cuba. To spread American values. To ensure a weak and independent Cuba. Perhaps to help the economy recover from the Panic of 1893. Perhaps citizens were looking for new frontiers. 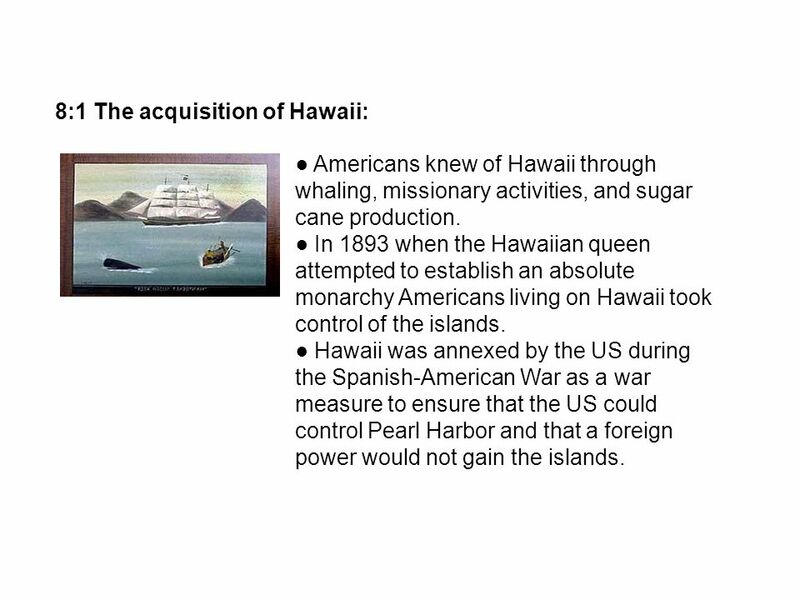 5 8:1 The acquisition of Hawaii: Americans knew of Hawaii through whaling, missionary activities, and sugar cane production. In 1893 when the Hawaiian queen attempted to establish an absolute monarchy Americans living on Hawaii took control of the islands. Hawaii was annexed by the US during the Spanish-American War as a war measure to ensure that the US could control Pearl Harbor and that a foreign power would not gain the islands. 6 8:1 The acquisition of the Panama Canal: The French were building a canal across Panama under a contract with Columbia (Panama was a province). When the Columbian Senate refused to allow the US to purchase the French right to build a canal the Canal Company and the US encouraged the Panamanians to revolt. 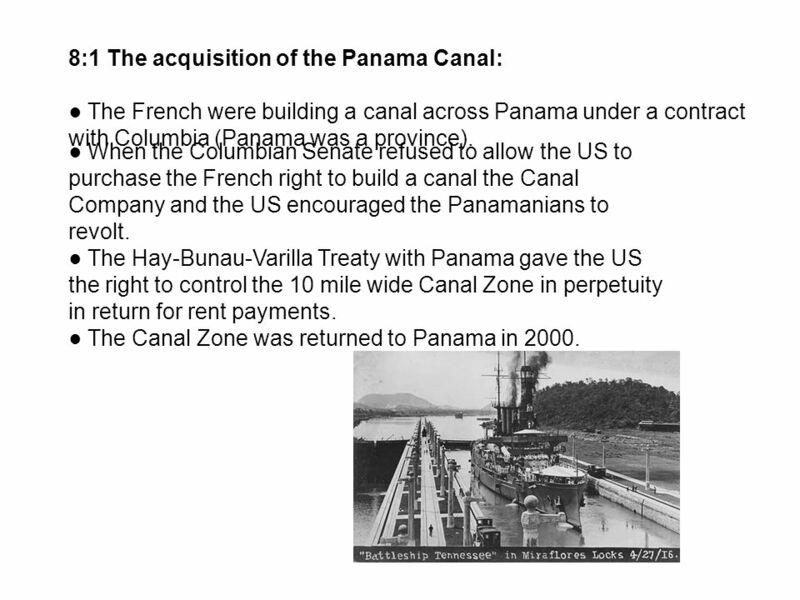 The Hay-Bunau-Varilla Treaty with Panama gave the US the right to control the 10 mile wide Canal Zone in perpetuity in return for rent payments. The Canal Zone was returned to Panama in 2000. 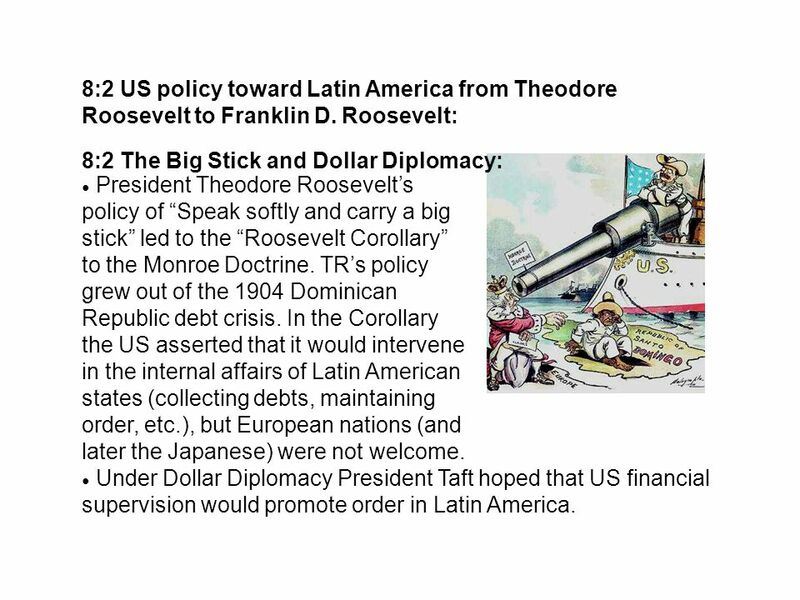 7 8:2 US policy toward Latin America from Theodore Roosevelt to Franklin D. Roosevelt: 8:2 The Big Stick and Dollar Diplomacy: President Theodore Roosevelts policy of Speak softly and carry a big stick led to the Roosevelt Corollary to the Monroe Doctrine. TRs policy grew out of the 1904 Dominican Republic debt crisis. In the Corollary the US asserted that it would intervene in the internal affairs of Latin American states (collecting debts, maintaining order, etc. ), but European nations (and later the Japanese) were not welcome. Under Dollar Diplomacy President Taft hoped that US financial supervision would promote order in Latin America. 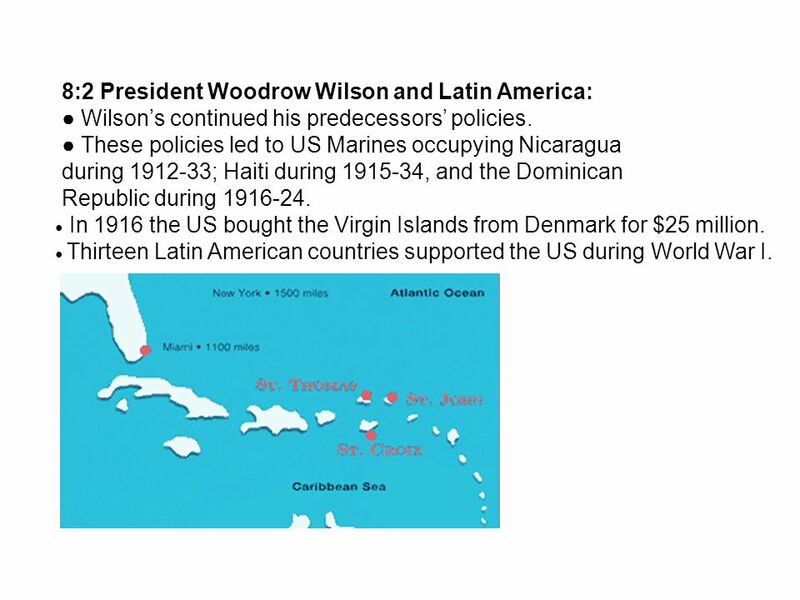 8 8:2 President Woodrow Wilson and Latin America: Wilsons continued his predecessors policies. These policies led to US Marines occupying Nicaragua during 1912-33; Haiti during 1915-34, and the Dominican Republic during 1916-24. In 1916 the US bought the Virgin Islands from Denmark for $25 million. 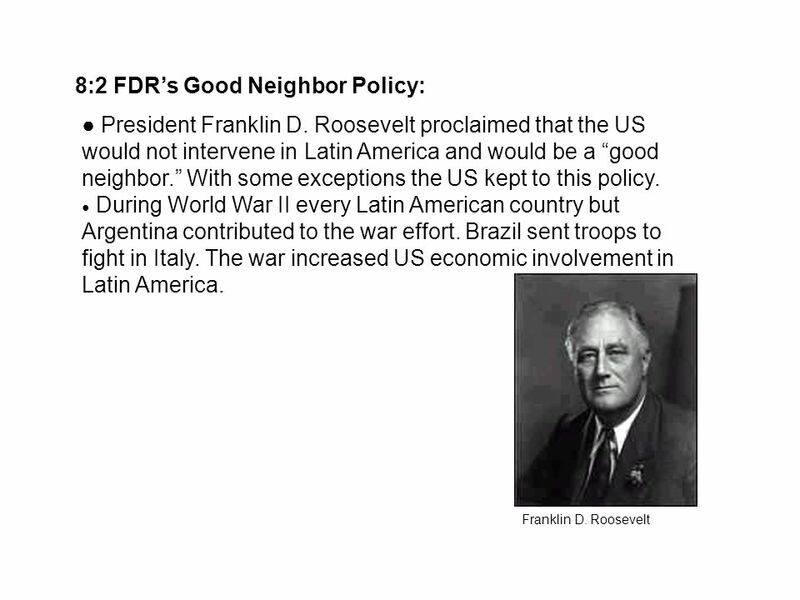 Thirteen Latin American countries supported the US during World War I.
Download ppt "UNIT 8 US FOREIGN POLICY IN LATIN AMERICA, 1898 TO 1945 8:1 US overseas expansion: US policy toward Latin America was based on the USs self-interest. The." Latin America and the US after the Spanish-American War. MS. JEROME Early 20 th Century Foreign Policy. A Changing Era The dawn of the 20 th century saw the U.S. as an imperial power. Each president of the new. The Imperial Debate: The Americas Sp/Am War Aftermath: The Imperial Debate Teller Amendment (1898)- United States will not establish permanent. Analyze the effects of Roosevelt’s “big stick” diplomacy. How does the American position in the Pacific create power and trade opportunities for the United States? ©2012, TESCCC US History Unit 04 Lesson 01. Chapter 17 Section 3 A New Foreign Policy. Imperialism in Latin America Monroe Doctrine of 1823 "the American continents, by the free and independent condition which they have assumed and. 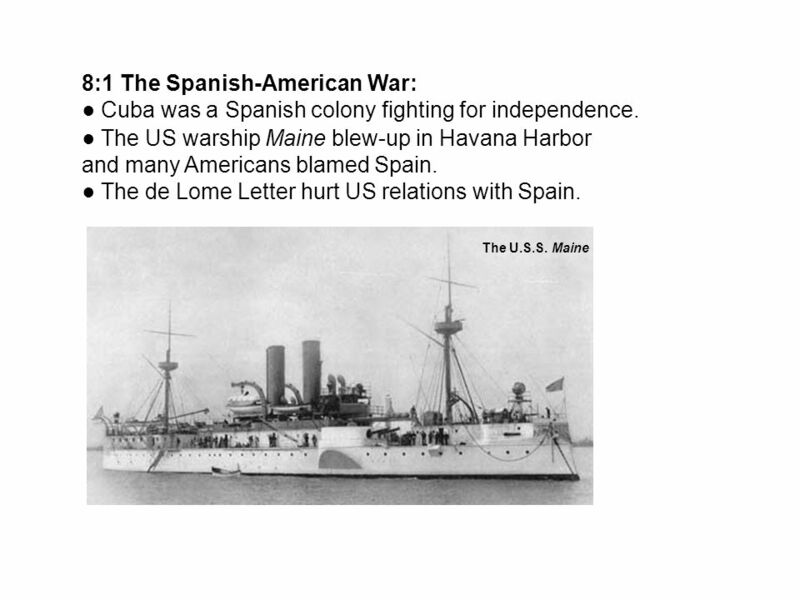 The Spanish-American War lasted from April-August 1898. United States’ Foreign Policies: Big Stick; Dollar Diplomacy; Moral Diplomacy; applications and impact on region. C ALL TO F REEDOM HOLT HOLT, RINEHART AND WINSTON 1865 to the Present 1 AMERICA AS A WORLD POWER (1865–1914) Section 1:The United States Gains Overseas.  Racism - Social Darwinism…  Economic - trade, farming, resources…  Nationalism - compete with Great Powers  Christianity - missionaries…  Humanitarian. 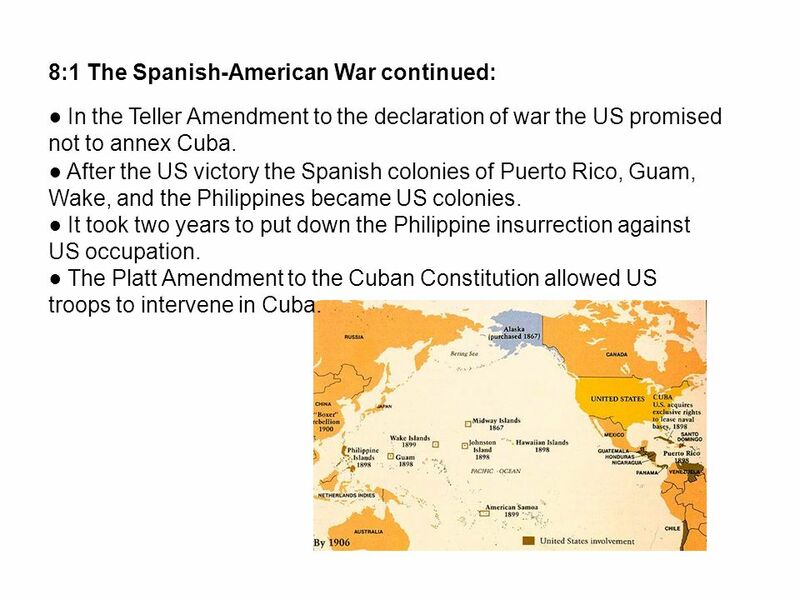 AKS 43a - describe the Spanish-American War, the Philippine insurrection, and the Constitutional debate over American expansionism 43b - explain U.S. US Imperialism CH 10 Notes.